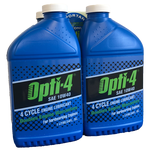 Interlube is so confident in Opti-4's ability to increase performance and extend engine life through its Eutectic anti-wear additive that when a qualifying pack of Opti-4 is purchased with a new piece of 4-cycle power equipment, Interlube will double the engine warranty on internal engine parts up to 31hp. Interlube takes the standard manufacturers engine warranty of two years and doubles it to four years (3 years to 6, 5 years to 10, etc. ), twice the period of time offered by the engine manufacturer. Not only is your engine protected from wear, but you are protected from potential costly repairs for an additional two years. 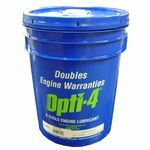 At the time of equipment purchase also purchase a qualifying pack of Opti-4, then simply go to www.opti2-4.com and fill out the warranty registration information. If a failure occurs during the extended warranty period, the equipment is taken back to the servicing dealer who then files a warranty with Interlube instead of the engine manufacturer. It's really that simple. Interlube has been in business for over 35 years and has proven to be an industry leader in anti-wear oil technology. Meets current API spec SN.